432 people in our community are currently praying with you. Not your usual Christmas carol! This lovely hymn is an old Slavonic Orthodox work, "O Virgin Pure", which exalts Mary as the Mother of Christ. 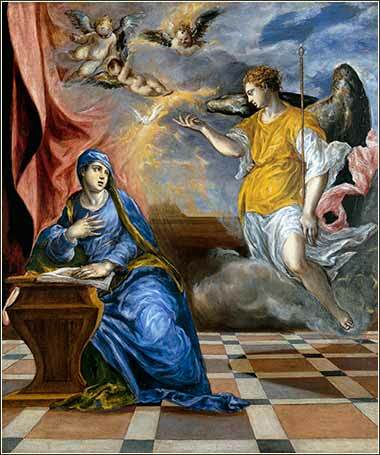 El Greco painted innumerable variations of the Annunciation. This late work, c. 1576, shows less of his highly stylized mannerism than his earlier versions. It clearly reflects works of the 16th and 17th century; the composition is very close to the Champaigne painting, below. Now in the sixth month [of Elizabeth's pregnancy] the angel Gabriel was sent by God to a city of Galilee named Nazareth, to a virgin betrothed to a man named Joseph, of the house of David. The virgin's name was Mary. And having come in, the angel said to her, "Rejoice, for you are highly favored. The Lord is with you; blessed are you among women!" But when she saw him, she was troubled at his saying, and considered what manner of greeting this was. 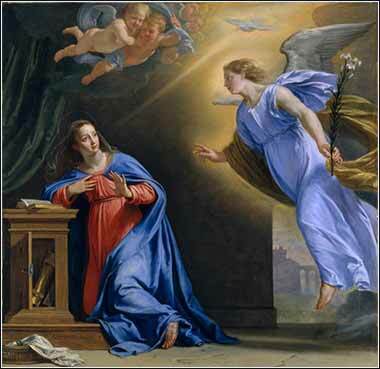 Then the angel said to her, "Do not be afraid, Mary, for you have found favor with God. And behold, you will conceive in your womb and bring forth a Son, and shall call His name Jesus. He will be great, and will be called the Son of the Highest; and the Lord God will give Him the throne of His father David. And He will reign over the house of Jacob forever, and of His kingdom there will be no end." Then Mary said to the angel, "How can this be, since I have never known a man?" And the angel answered her, "The Holy Spirit will come upon you, and the power of the Highest will overshadow you; therefore, also, that Holy One who is to be born will be called the Son of God. Now indeed, Elizabeth your relative has also conceived a son in her old age; and this is now the sixth month for her who was called barren. For with God nothing will be impossible." As with Zechariah, the angel Gabriel acts as God's messenger. The Catholic/Orthodox churches and Protestant churches differ in the degree of importance placed on the veneration of the Virgin Mary. Orthodox churches know her as "Theotokos", Greek for "the bearer of God". They place more emphasis on Christ's conception, as opposed to His birth, being the moment at which the salvation of humanity begins. 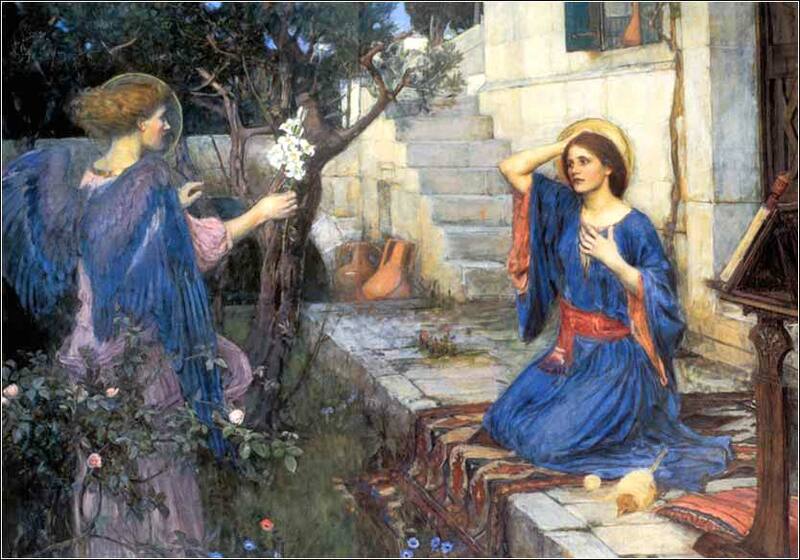 How a person worships is a very personal matter; some Christians place great emphasis on the Annunciation as the moment when the Good News was first told; some place great emphasis on Christmas; and at the opposite extreme, the Pilgrims did not even celebrate Christmas. Reacting to the debauchery of the holiday in Great Britain, in 1659 the Puritans of Boston formally banned this "great dishonor of God and offense of others"! Let us join together during the Christmas season in celebrating the unity of all Christians; setting aside differences to emphasize the common beliefs of all who confess Christ to be their Savior.